Your home is supposed to be your safe haven – except when you're allergic to it. A nationwide study found that over half of all Americans test positive for at least some allergens, and many of these are indoor allergies such as dust, mold, and pet dander. 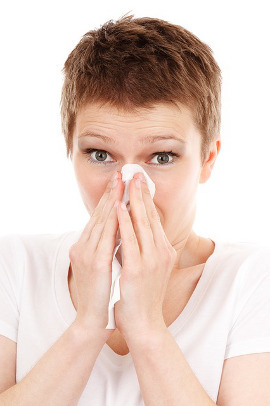 How can you help solve the allergy problem in your home, so it's a refuge, not a source of sneezing and itchy eyes? First you should know where the allergens are lurking in your home. In Your Mattress – The bedroom is the most allergen-prone room in your house, because the most common indoor allergen is dust mites. The single most important thing you can do for dust mite allergies is to steam clean your mattress! Most people don't do this or even think about it. They put hypoallergenic casings on their beds, mattresses, box springs, and the pillows, but what if the dust mites are already in your mattress? In Your Carpets & Floors – Carpet is a virtual magnet for allergens like dust mites, pet dander, mold spores and other potentially aggravating proteins. Studies show that many of the particles that are brought into the house are on your shoes and this will be tracked all over your home. Carpets may contain 100 times more allergens than hard floors. In Your Furniture – Heavily upholstered pieces also collect dust mites, pet dander and mold spores. There is a great deal of dust that collects up high on molding, light fixtures, paintings, etc and down below on bookshelves, end tables, heavy curtains and drapers, upholstered blinds, etc. High/low dusting are essential to keep allergens to a minimum. In the Kitchen & Bathrooms – Mold from moisture also tends to accumulate in both the kitchen and bathroom and will aggravate allergies. In Your Kids' Rooms – Stuffed animals, blankets, pillows and carpet in children's bedrooms are also a culprit of allergies. On Your Pet – Our sweet furry babies bring allergens into our homes, onto the beds, carpets and sofas on their fur. Allergies to pets are usually reactions to a protein in pet saliva, dead skin flakes (dander), or urine of a furry animal, not to an animal's hair. In the Air Ducts – Also dust or debris is being released into your home through your system's air supply registers. According to the U.S. Environmental Protection Agency (EPA) you can have rodents, insects, or other vermin infesting your ducts. The ducts can be clogged with dust and debris. The surfaces of your ducts or other components of your heating and cooling system can have a substantial amount of visible mold on them. In Your Cleaning Products – Using the wrong cleaning products to minimize allergens like dust mites, pet dander, and mold can actually make your allergy symptoms worse. Using products with strong noxious odors, such as ammonia, and products that produce particulates, including air fresheners and aerosol spray cleaners really aggravate allergy symptoms. Not only can they aggravate allergy symptoms, but one study also found that weekly use of cleaning sprays was linked to increases in rates of asthma, asthma-medication use, and wheezing. Even more frequent use of these cleaners was associated with greater risk. Green Products – We use green and low toxicity cleaning products to clean your home. High/Low Dusting – We concentrate on high/low dusting of chandeliers, fans, bookshelves, baseboards, molding, etc. Any surface that collects dust. HEPA Filter – All our vacuums have a HEPA filter and we bring a brand new one when cleaning your home. Sanitize Mattresses – We remove all germs from your mattress. Air Duct Cleaning – We use a professional air duct cleaner by ROTOBRUSH to clean out your air duct system. Carpet/Upholstery Cleaning – We clean your carpets and upholstery.